Holiday Coffee Goodness – Our Cup Overfloweth! As families spend time together this holiday season, we share this as our thank you — for your gatherings around the table, journeying in the car, relaxing on the couch, during spirited conversations, and while cooking in the kitchen. There are so many moments for a great cup of coffee, but the time of family and friends….precious. Make it so. Here, we often grab coffee in a rush, sipping it in to-go mugs while we race through traffic or spending $5 or more without thinking from an app for mobile pick-up. 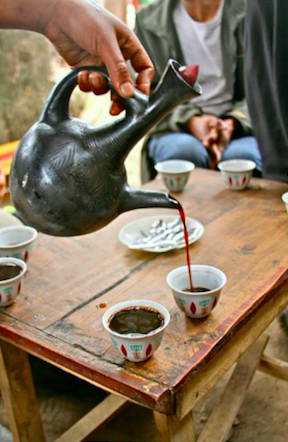 Ethiopia is considered to be the birthplace of the brew. Coffee culture is slow and steady, a daily ritual unfolded in nearly all households for every member of the family. Steeped in tradition, coffee has been prepared similarly for generations, with a ceremony carried forward by the matriarchs. Families gather in a communal room for the custom that luxuriates over hours. One coffee pot, or jebena, holds the ground coffee which is brewed in three rounds. The rhythm of simmering and serving includes blessings for all at the table. The first round of robust coffee, called abol for its strength, is served first to elders and guests. Tona follows, the second round of coffee made from boiling water poured over the same grounds. Finally, the third course, called bereka, symbolizes acceptance as the rite reaches its blessed state for all who share in it. Children are offered a cup of the languid last round. The invitation to the table is a sign of respect for Ethiopians, who attribute the coffee ritual to the desire to create time and space to transform the spirit. Guests give thanks for good fortune as they drink a cup from each round of the ritual. Families share news, elders debate community issues, children play at the feet of their parents. Prepared by many hands — some adding sugar, spiced butter, salt, herbs or milk — coffee is considered a benediction to each day, a sacred act of care and sharing to bring a close community together again and again. Roots Ethiopia lifts our mug to you in a sacred thank you for all of your support in 2016! Previous Previous post: Science Teachers – Innovation and Exploration! Next Next post: 7 Incredible Things YOU Did in 2016! Roots Ethiopia is a 501c3 non-profit and works in Ethiopia as a licensed NGO.